The tabletop is supported by thin cutoffs of a bridge beam. 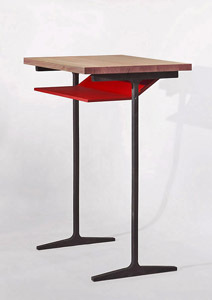 Below the tabletop of clear oak a red shelf,formed from a thick aluminum plate, braces the beam legs and forms a rigid trestle assembly. Width 21" Length 29" Height 38"